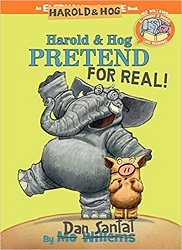 ﻿ Sonderbooks Book Review of Harold & Hog Pretend For Real! Hyperion Books for Children, May 7, 2019. 64 pages. Review written January 27, 2019, from an advance reader copy I got at ALA Midwinter Meeting. This is another book in the series Elephant & Piggie Like Reading!. Mo Willems’ Gerald and Piggie characters appear at the beginning and end to introduce a book written by someone else. This one is delightfully meta, because the book they’re introducing features an elephant and a pig – Harold & Hog – who want to pretend to be Gerald and Piggie. Harold and Hog are drawn by Dan Santat, much more realistically than the cartoonish Gerald and Piggie. They have glasses to pretend to be Gerald and a cartoon nose to pretend to be Piggie. But there’s a problem when they try to carry it out. Because Gerald is always very careful – but Harold has trouble with that. And Piggie is always very carefree – but Hog has trouble with that. Their efforts in that direction are tremendously fun before they come up with a solution. I’m writing this in my Seattle hotel room while at ALA Midwinter Meeting. We chose our Newbery winners last night but don’t announce them to the world until tomorrow morning. I’m feeling a little giddy ever since I realized that I can write a review of this book – a 2019 publication – and post it this very day! Of course, the book won’t be published until May, but this is one to watch for! Watch book characters pretend to be each other! Too much fun!